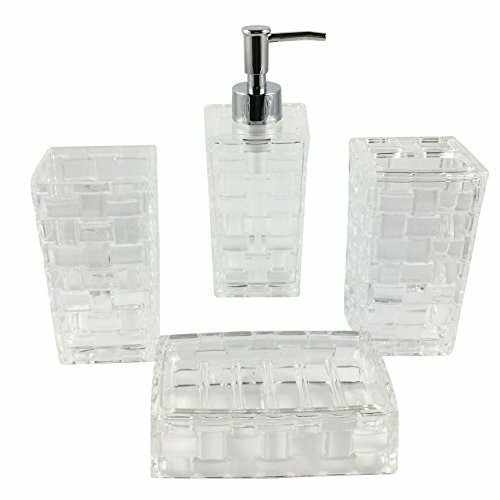 If you are looking for a way to add some elegance to your bathroom, or a gift for a friend who appreciates the finer things in life then you can’t go wrong with the Mirror Janette 6 Piece Bathroom Accessories Set as its classic white and silver design will add a touch of class to any bathroom. If white is not your thing then there are some other truly stunning luxury bathroom accessory sets to look at. If you are planning to buy an accessory set then you are obviously hoping to achieve a polished and complete look. This means you will need to consider the color of the set so that it complements your bathroom to the greatest effect. 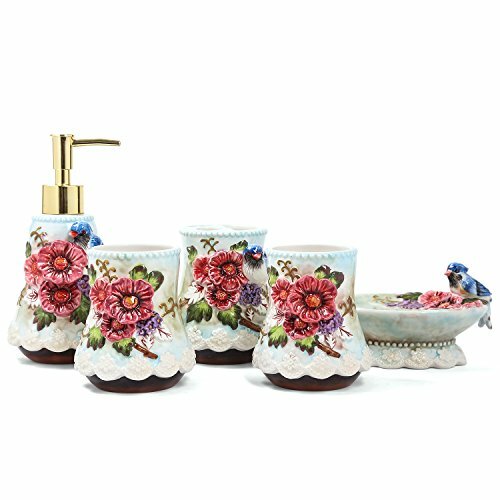 If you are planning to buy this set as a gift then you would be best off selecting a set that has a neutral tone so that it would work in any bathroom. These sets come with different numbers of items in them and not always the same items. When making your selection you should check that the set has items that you will use. A very common configuration for a five-piece set would be matching: Soap Dispenser, Toothbrush Holder, Tumbler, Soap Dish & Tissue Cover. Some sets come with a matching bathroom trash can in the same style as the other accessories. If the set you like doesn’t include one, you may want to check out these slim trash cans that have an elegant narrow profile and stainless steel finish that would work with most luxurious bath sets. If there are items missing from the set that you want, you may make sure the same brand sells that individual items in that same color and style if you decide you want to add to the set later to compliment your bathroom so make sure you’ll be able to buy them separately. 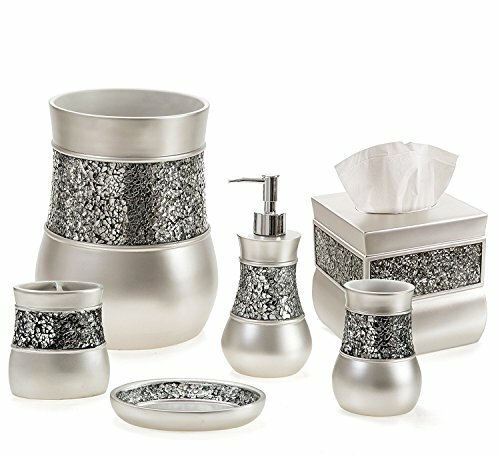 This elegantly designed bathroom set includes an unusual and quite beautiful square soap dish, a liquid soap/lotion dispenser, a toothbrush holder, tissue box cover, a clear glass tumbler in a patterned stand and a wastebasket. All the pieces are white with mirrored inlay which means they will fit well into any bathroom. The pieces are made of high-quality resin which gives them a pleasing weight, and a real feeling of high quality and luxury. The downside to the weight is that there are no protective feet on the bottom of the countertop items, such as the tissue box cover which could lead to it damaging the surface it is placed upon. The other downside with the tissue box cover is that it is a little shorter than some standard tissue boxes, so you may need to squash the bottom of your tissue box to get it inside. In matching designs, you can also buy separately a cotton ball holder, a rectangular tissue box cover and a bathroom organizer. 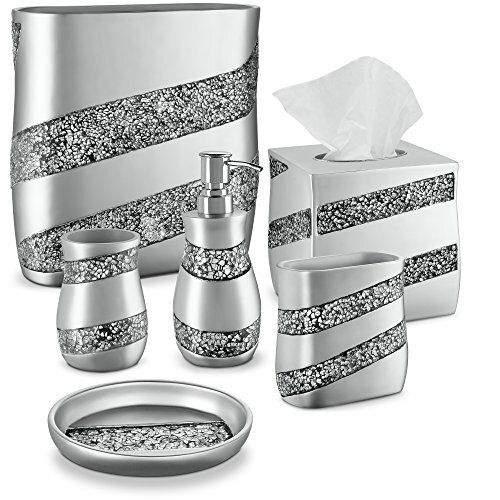 This bathroom set is a lovely way to add some sparkle to your bathroom. The resin material of the set is designed to last in a bathroom environment without becoming discolored or grimy looking. The silver color and sparkly mosaic pattern offer a luxurious feel to your bathroom. The set consists of an oval soap dish, a liquid soap/lotion dispenser, a toothbrush holder, tissue box cover, a tumbler, and a wastebasket. You can also purchase matching bathroom organizer, rectangular tissue box cover and even shower curtain hooks if you really want to have the full matching effect. 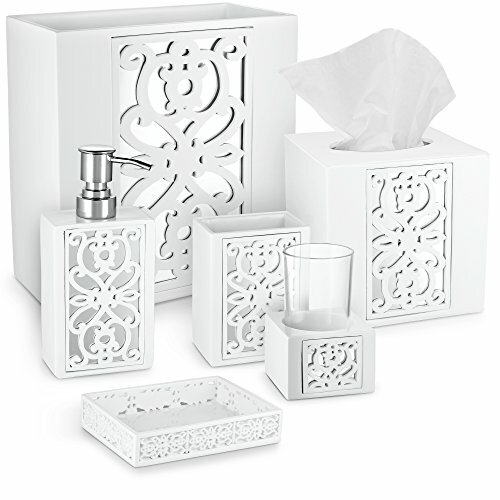 The tissue box is square but you can buy the rectangular model separately if you tend to buy tissues in that format. 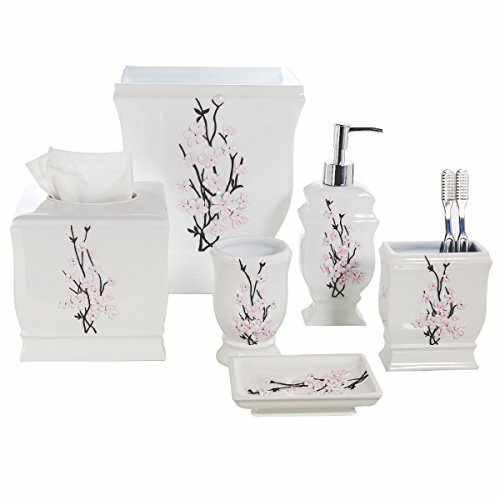 This vintage style bathroom set has a Japanese feel to it with a beautiful cherry blossom design. The main color is white with contrasting black branches and delicate pink blossoms. Each of these pieces is a lovely feature item. The set consists of a rectangular soap dish, a liquid soap/lotion dispenser, a toothbrush holder, tissue box cover, a tumbler, and a wastebasket. In addition, there is a wide range of further pieces, including a cotton ball holder, shower hooks, rectangular tissue box, and vanity tray. The tissue box cover is again a little on the small side, so you will either need to purchase the smaller size of square tissue boxes or squash the bottom of the box. This limited-edition set is tailor-made to give as a gift as it comes beautifully packaged. The base of the items is silver in color with seashells and creatures, the rest of the design is made with a blue Ombre resin with a lovely curved design. The description cannot do these pieces justice. The set includes a toothbrush holder, liquid soap/lotion dispenser, soap dish, and two tumblers. Unfortunately, there are no further pieces to add to the set but the design on these is truly striking and they will certainly bring a bathroom together with no further pieces. This lovely set is made of resin but has been made to look as if it is silver brushed nickel which gives it the look of luxury without being overly expensive. The lovely color with added mosaic tiling gives a very elegant feel to the set. Included in the main set is an oval soap dish, a liquid soap/lotion dispenser, a toothbrush holder, tissue box cover, a tumbler and a wastebasket. Once again, the tissue box cover is a little on the small side so you may have to get creative. As well as the main set there is a very wide range of extra accessories in a matching design. These include a shower curtain and hooks, free standing towel rack, the old faithful of a rectangular tissue box cover. You can truly have the full set of matching items in your bathroom. 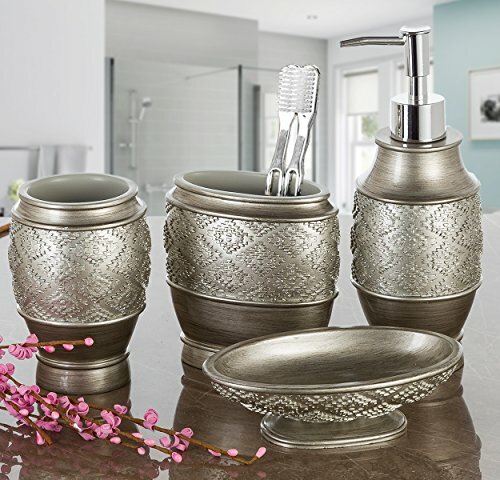 The Dublin 4-Piece Bathroom Accessories Set would satisfy the taste of anyone who loves ageless and classic design. Its extraordinary look with the beautiful diamond patterns and the interesting combination of smooth and sharp lines gives the bathroom that interesting accent. The eye-catching design of each piece would give an instant feel of elegance whether you have a modern, industrial, or contemporary styled bathroom and the rich silver tone and the metallic luster allows it to easily blend in any space and with other bathroom accessories. The set is not just about great design but of great quality as well. These beautiful looking pieces are made of high-quality material such as heavy resin that makes it corrosion and rust resistant. With its elegant and classic style and excellent quality material, this is not only good for your bathroom but would make an awesome present or gift to your friends and loved ones as well! Pump mouth is too straight, needs to be turned down to avoid accidental spraying on yourself. Some say that they have accidentally sprayed liquid soap to their face because of this. 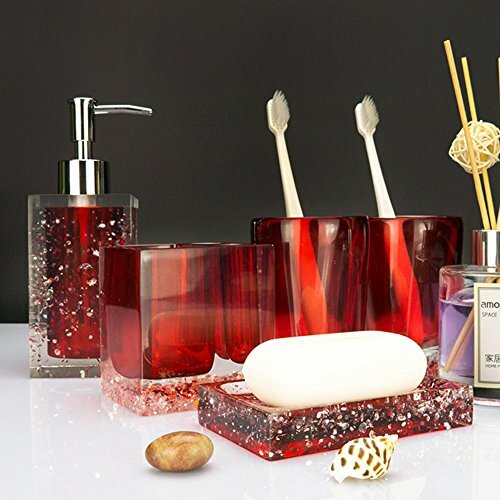 The LUANT 5-Piece Resin Bathroom Accessory Set is a complete set of a soap dish, soap dispenser, toothbrush holder stand, and 2 tumblers. The toothbrush holder can hold 4 toothbrushes and the tumblers are multipurpose. They can be used for rinsing, drinking, and even storing razors, tweezers, and makeup brushes. This set can not only be used for various purposes but the pieces are also of excellent quality. They are made of premium quality and environment-friendly resin. Each piece has a solid metal base that makes them sturdy and ensures it’s not as fragile as those that are made of glass or ceramic materials. The pump is also made of top-grade and premium quality steel that cannot be easily deformed or broken and has a bronze coating which is rust proof. The set also comes in different colors which you can choose from whichever would suit the look and feel of your bathroom. The Hampton Bathroom Accessories Set has a contemporary modern design that can give character and new life to your bathroom. It has a cheery pattern and it comes in different colors to match your bathroom’s style and look. The 4-piece acrylic set is not only decorative and pleasing to the eyes but are of great quality and are quite versatile too. The soap dish has a deep-set design that keeps your soap bar in place, helping you avoid messy bathroom sinks or countertops. The beautiful tumbler cups also give an elegant touch to the set. The set also has the shampoo and liquid soap dispenser that has a durable metal pump that won’t easily break or clog. Style meets functionality with this set and you won’t even have to break the bank to get that great aesthetics for your bathroom because of its affordability. The shampoo and liquid soap dispenser pump is not a one-hand pump. Some users are not a fan of the material which is acrylic and not glass. The Forlong Ceramic Bathroom Accessory Set is a ceramic set of 5 that comes with toothbrush holders, 2 gargle toothbrushing cups, soap dishes, and a soap & lotion dispenser. The Forlong brand adheres to originality and you can see it in the designs of their product. Each design shows delicate and elegant craftsmanship with its vibrant colors and cheerful scenery. The products are handmade which means the 3D designs and patterns are manually molded, painted and has gone through different kinds of process to show originality and exquisite outputs. Even with all its elegance and vibrancy, the material and texture of each piece are FDA approved, environment-friendly and has that magic of mud to accentuate and highlight the beauty and glamour of porcelain art. With its beautiful 3D art design, elegance and premium-quality material, this would be a perfect and high-quality gift for special occasions like weddings, birthdays, and the like. This is a great option to give as a token to your family, loved ones, and friends. The pieces are lightweight so you have to be careful in handling them as they can easily break when they fall off your countertop or sink. 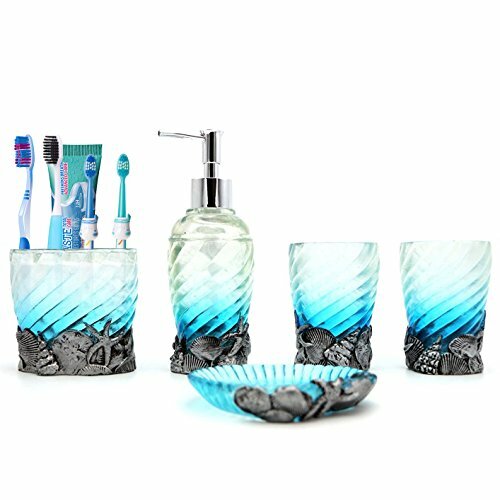 The top pick is the Mirror Janette 6 Piece Bathroom Accessories Set because you really can’t go wrong with white, but for the more unique feel, I personally adore the Ocean Blue 5 Piece Bathroom Accessory Set. Either way, you will have a set of accessories that will make you smile every time you use your bathroom.